The idea of the Market was first envisioned in 1976 by a handful of local farmers with a surplus of crops (due to declining sales at their farm roadside stands) deciding to band together one Saturday morning, in a parking lot near, town with the goal of making their goods more accessible to the local community rather than asking the community to travel to each farm individually. One farmer decided to also provide fresh coffee and from there the Annapolis Royal Farmers & Traders Market was born. 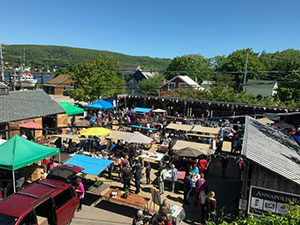 Fast-forward 40+ years and that handful of farmers in a parking lot has grown into Nova Scotia’s largest outdoor Farmers Market and longest running of any other farm market around. Boasting over 100+ vendors each Saturday (weather permitting of course) you’ll find everything from farm-fresh produce, fresh-baked breads and other baked goods, jams and jellies, locally produced beer, wine, spirits, locally roasted fair-trade coffee, an array of prepared foods to tempt your taste buds as you shop, fresh cut flowers and plants, handcrafted soaps and other personal body products, pottery, rug hooking and many other hand-made crafts, clothing – both vintage & original designs, bicycle repair, custom-made shoes, woodcarvings, jewelry, original artwork, and the list goes on! We also have live entertainment each Market day showcasing a multitude of musical talent from right here in Nova Scotia! It’s our own little outdoor kitchen party! Check out our events calendar for more details. As a volunteer community organization, we pride ourselves on fostering genuine relationships and appreciation for our customers, one another and our community as a whole. We may be small-town folks but we have big hearts and love what we do! Taking a trip down the Valley? Why not stop by the Market Square for a visit and let us show you some good ol’ small-town Maritime hospitality!